Sour sop known to many as graviola or (spanish guanabana) has been know for ages for its medicinal uses and properties including treatment for sleep disorders, bedbugs, fevers, cough etc. However recently there has been an increase in the demand for this graviola fruit due to its recently discovered medicinal value which some studies suggest that graviola may be used in the treatment/cure for cancer. One of the question ask by many is, “how to make sour sop tea” using the sour sop leaves. Here I will explain how it has been done traditional. 2. Add 1 cup of water in a small pot and bring it to a boil. 3. Cut the sour sop leaves into smaller pieces by tearing it apart; each leaf in three pieces. 4. Place the gravoila (sour sop) leaves in your tea cup (glass, cup) and pour the boiling water on it then cover for 30mins – 1 hour ( this process is commonly called drawing the tea). 5. Drink warm or cold – you may add sugar and milk for taste. Note: The senor folks always tell me “do not pick bush for tea after 6: pm when the sun is down” I don’t know why, but it may be a good thing to note. Thanks a lot for the information. This would assist my uncle who is presently fighting his prostate cancer (stage 4). I am grateful for this information. I have known about soursop for quite some time and have taken the leaves as tea very many times. I have prepared not exactly as is described here because I cut the leaves with knives, not tea it with my hands, and I take both the mature and younger leaves, not only the younger leaves. I did not know that it is good for cough. Incidentally I have cough now so, I am going to try it. Please share your findings after trying the tea,your information may just help someone. All that you have said is true. I have been using soursop leaves pretty often in the last few weeks to help me sleep as work related stress have kept me awake many nights. I’m glad you are letting others know about this natural way to induce sleep. the side effects are nil. i can send you some free of cost, just let me know. I am being treated for cancer and am interesed in trying this. My daughter sent me this information but I have no idea how to obtain it. Can it be grown in the U.S.? Hi everyone. I am trying to get some people to share their experiences with soursop tea. For those who have been using the tea as a cancer treatment or know of someone who has been using it, could you please share your experience with us? 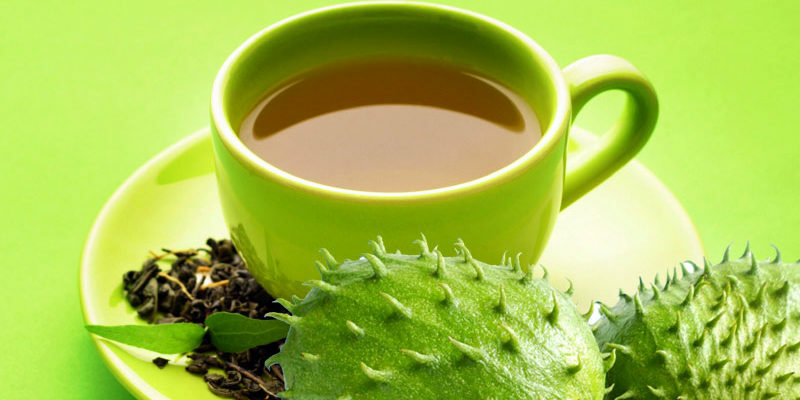 Has Sour Sop Tea Cured Your Cancer or Improved Your Health? Share You Story or go to http://degraviola.com where you will find the topic. I would also welcome preparation methods that have worked for you and any recipes you have for making something delicious with the fruit. Thanks and best wishes for a healthy life to everyone. To the author: Great information. my name is anna and my father has the cancer. I read about the graviola leafs. Please send it to me if you have them. I can pay you over the mail. and stem. thats what you need. you can call el chino nursery in miami and chino can send you a tree. keep it away from frost. I keep it in my garage during cold season and late spring and summer out in the large pot. I believe that you can find graviola (soursop) from the Mexican market. Plenty of them if Hawaii. I have a soursop tree and for the first time I’ll try the tea. I have digestive issues that I hope it will go away. Hi! I am from the Philippines and a cancer survivor. We do have guyabano tree all around and all year round, that’s why we were able to come up with a raw organic guyabano tea ( has leaves and bark of the tree ), not the tea bag type, not fermented, not processed. All we did was cut the stem ( with leaves ), chop into small pieces, air dry and grind it. We have sent the tea to Australia and US. We only sell it for $4.50 per pouch ( could make 12 to 14 liters ), but the buyer shoulders the shipment cost. Should anyone be interested, email me at mcolibao@yahoo.com. I’ve been getting inquiries from New Jersey, Texas and New Zealand. By the way, this product os also BFAD ( Phils.) approved. I am from Philippines, I am have hypertension my B.P. always ranges from 140 to 160 over 110 for more than 5 years. i am only 42 yrs old, my hypertension started as early as 35 yrs old. only last april 2012 i’ve learned this graviola is very effective in hypertension. also i have insomnia since college days as early as 19 yrs old.Since i started taking Guanabana tea my B.P. and Insomnia becomes normal. make also a guyabano shake. include the skin. the most effective substance is found in the skin. I read about the wonder guyabano tea and I have started taking it. How safe is it when taken with my prescribed treatment for my condition which is “multiple – myeloma cancer” at early stage. When should I expect to feel the signs of recovery. I would like to know the best dosage to take. I am currently taking one glass in the morning, one in the afternoon and one before bedtime. Can this wonder tree heal a breast cancer that has been spread to every part of the body including joint, and how best to use/take the tree, i mean does it have dose? The soursop leaf may be even more beneficial to us than the fruit itself, some of its uses are well known by herbalists around the world and we should take advantage of the . If your are not a cancer patient and this is readily available to you please do not take it for granted, us it as a form of prevention. Hello,please if anyone knows how cancer can be cured using soursop or anyother plant should please get back to me as fast as posible.please save a life. I can be reached via nicebaby98@yahoo.com.thanks. One of my best friends was one step away from 4th stage colon cancer. She did begin chemo and after 5 chemo treatments and drinking the sour sop tea twice a day for about 3 1/2 months, she is cancer free. She was also borderline diabetic and now her sugar levels are normal. I have started drinking this now as the trees here are abundant. If you have cancer and receiving treatment, drink this tea. i am in united arab emirates,from where i can get this graviola leafs?because one of my nearest friend need this treatment,plz help me to find these leafs,i will be very thanksful to you,my cell numb is 00971551661700. I have just heard of these Guanabana leaves and that it is good for cancer. My mom has stage 4 bone cancer and I want to try this tea. How do I prepare this and how many times a wk should she drink this?? 7. Helping the process of recuperation. I would like to have access to the leaves or trees i will pay to have these trees shipped. Please tell me how to get these products that I can trust Thank you. Cindy Crone 330-478-5122 or 330-284-5323 I live in Ohio. is this soursop tea can lower the high blood sugar? can cure diabetis? How much and how long I have to continue drinking sour sop tea to get rid of cancer?where can I get sour sop tea If I live in Houston Texas USA? Does anyone know where I can buy the soursop leaves (not capsules)? Are you in Dom Republic? All of centeral america and south america this should be a native plant / tree. Buy the fruit at the store, dry and plant the seeds in the sub tropical climate good soil will grow fast. As part as I know each the seeds or the tree are not allowed to ship specially if that tree are not groeing in specific country. I will try what can I do to help you. We do have lots of that tree in our backyard and I always make a tea every night for my husband. To everybody who needs help to find this guyabano leaves, tea, tree. I can help you out. As far as I know we are not allowed to send a seeds specially if that place don’t have this kind of fruits/vegetables seeds. I am from India .My wife age70 years is a cancer patient and had chemo therapy thrice in 15 years..reacurance of cancer. the sour sop tree is very common in Jamaica, it is in abundance. i would suggest coming here and try to see if you might have any Indian friends that are working here so as to get the leaves but i would recommend that you get 1 of the small plants. all the best, tika. people please bear in mind that the sour sop is not 100% effective, its just like anything else that someone might take and some persons may have different side-effects. Can Guanabana be purchased and sent to The United States? I have been recently been diagnosed with breasted cancer and am interested in trying. i have family living in the USA and what my mom does is sent some leaves each time someone is visiting Jamaica. MY MOM HAS A GUANABANA TREE IN HER YARD. I HAVE SOME LEAVES HERE. how many glasses aday to drik guanavana tea?? only a doctor can tell you the correct measurement. We purchased the crushed leaves for tea. I have a friend who has bone cancer. Would this help him? Can he start taking it when he is in Kemo? He said he would not went to treatment if he wouldve know about this or about the red reeshi mushroom(which also helps cancer). They said he cannot take the mushroom while in Kemo. I just met a young lady diagnosed with breast cancer spread to the bones and was given 3 months to live; that was back in 2010. She took those 3 months to detox and refortify the immune system with natural therapies then began radiation – she refused kemo. She takes many natural remedies at the same time with 2 other cancer medications, including drinking soursop tea as her only water daily. So far so good. You wouldn’t believe she has bone cancer by just looking at her. She said she lost all her hair but its back again. She prepares the tea this way: a big handful in a pot of hot water, does not let it boil, just simmer a few minutes then lets it sit overnight. In the morning strains and refrigerates it. That’s all. She also drinks vegetable juices, avoids sugar and bacteria in her body among other things. She’s proof you can mix and match therapies. Hi Luisa! May i know for many days will the refrigerated soursop tea good for consumption? Want to try it for myself. how many times a day should this tea be consumed for it to be consumed correctly for medical use? My grandmom brought me so Guanabana leaf from Mexico but they are dried leaf. Can you still boiled them and make your tea. my sister is suffering from 4th stage of ovarian and utrus cancer. she already had 4 cycles of chemos. she has started taking soursop tea. can she take this tea daily? should there be any break in between? if so how long? She can drink it for 6 weeks then take a 2 week break and drink Noni juice, then continue on the soursop tea. 10 leaves,6 cups of water boil down to 3 cups and drink 3 times daily(warm). Dont use the freshly picked leaves since they contain a high level of chlorophyll which is bad for the liver used leaves 2-3 days old. My granddaughter is 14 and has diabetes”one” how much should she take a day,I have the plant and make 8 leaves to 6 cups of water evey 2 days, is that too much? Someone came to me with the so many disadvantages of this wonderful plant. I have been so happy and glad at its discovery but he got me scared? Could you please tell me some of the DISADVANTAGES? I am still very optimistic about your posts on the plant but I am scared and I really really need your help? Thanks while I am waiting. Samuel, To this date the only negative effects that have been reported include fatigue and an increase in the possibility of developing Parkinson’s disease. The studies that found an increased risk in Parkinson’s were done with extremely high amounts of the fruit ingested and if eaten in moderation this was not seen as a side effect. Also, with the regard to the fatigue, this is associated with consumption of the leaves and tree bark, which may be included in the tea but you will not ingest with the fruit or juice. Has anyone ever tried to use this on animals suffering from cancer? My cat was diagnosed this morning with kidney cancer and I have the leaves already. My sister_ in_law is diagnosed stage 3 lung cancer. She have undergone chemotheraphies tc. She is tired of chemotheraphies because it she said that it is not helping her. So she have h heard about this guyabano or sour sop leaves, and she is interested in trying it. How many leaves does she have to use, and how many cups in a day, and how many weeks, does she have to drink this in her condition. How nice thank you for a wonderful revlation. It is really working for I heard of a woman that had a concer and a nursing sister testify to us in a lifesyle promotion program in Bukuru plateau state Nigeria, that she has used the soursop to treat that patient who is well today. So is real and it works. I have read all through on how to make the sour sop tea. I don’t know the plant and I cannot find it here in Gombe state,Nigeria. I don’t know if you could assist in telling me where to find d plant here in Nigeria, specific. send me an email at samchi22@yahoo.com..i will help you with the leaves. The reason for not picking the leaves after 6 p.m. is that the trees are thought to go into sleep mode at that time. and are therefore not at their maximum strength. I think it is best taking sour sop fruits or tea from the trees grown in a biodynamic manner as the plants absorb herbicides, heavy metals, pesticides. I use bio pesticides, bio fungicides, bio nutrients from microbs and planted them onto soil imported from virgin forest for best results. Sour sop leaves are noticed to be some 10,000 times as potent as chemo. Can anyone get the WHO involved, so that the poor cancer patients do not lose their money and lives plus the sufferings to enrich some others? I have read sour sop prohibits rapid growth of cells – like in cancer. However, it should not be used by a pregnant women. It is native to Costa Rica; some people eat it daily for years. Excessive use can lead to nerve damage. I use the fruit in shakes several times each month. this is interesting. i recommend markizza soursop juice on amazon. the taste is just perfect. It is known by tha old mayan healers to pick the leafs of an erb in the day time from sun ip to sun down because that is when the sap is runing thruogh the plant and if you ar going to use the root then the best time is in the night time because the sap returns to the roots at night wile the plant sleeps. Hello, I have a graviola tree in FL and sent some leaves to my daughter you lives in CA as priority mail (they do not guarantee overnight in her area) they do not do so well. I didn’t put them in plastic but the envelope did have the bubble inner wrap. Is there a better way to ship them without bruising the leaves and arrive in better shape? We have around 300 fruit bearing graviola trees out of 1 thousand trees planted. Interested we can mail air tight pack dried leaves. In 1 or 2 kgs package, We also have pure graviola leaves extracts. Hello I have cancer and would like to purchase the soursop leaves! I live in Florida. If you drink the leaf juice, does it help to heal sores on your skin?? Please, I want to know if I can use the gwana bana leaf tea against thyroid growh, and for how long can I take it.Thank you . I would like to know the best place where to purchase Sour Sop tea leaves and how the leaves should be stored . Also what is the shelf life of the leaves after opening them .